ICERA introduced the Karo II. This sleek design incorporates all the best features of the original Karo model while adding a squared tank and chic transitional lines. 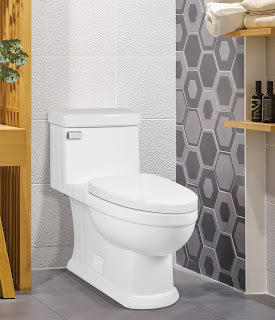 Its balanced proportions and advanced engineering combine to create an exceptional toilet that hits the mark in style, comfort and performance. Karo II is a one-piece elongated toilet that features ICERA’s anti-microbial MicroGlaze for a beautiful finish that offers better hygiene and superior stain-resistance. The skirted trapway gives the design a clean finished look and allows for easier maintenance. Crafted of white vitreous china, Karo II is ADA-compliant with a chair-height bowl and includes thoughtful features such as a Duroplast soft-close seat with quick-release. As a high-efficiency toilet, the Karo II is designed with ICERA’s signature EcoQuattro technology to consume just 1.28 gallons of water per flush. The Karo II comes with a polished chrome tank lever and seat hinge caps, with other finish options available separately including polished nickel, satin nickel, polished brass and venetian bronze, and is covered by ICERA’s limited lifetime warranty.